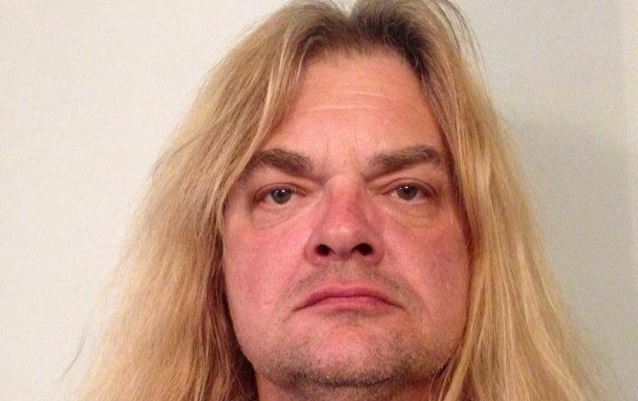 Dissonance Productions has announced the signing of STEVE GRIMMETT'S GRIM REAPER, the revamped version of the cult '80s British metal act GRIM REAPER led by singer Steve Grimmett, to a worldwide deal. The recently launched rock/metal label will release the band's new album, "Walking In The Shadows", on September 23. It will be GRIM REAPER's first new recording since 1987's "Rock You To Hell". Pre-order information for the album's standard and limited-edition digipak formats will be announced shortly. The release of "Walking In The Shadows" has been an anticipated announcement by fans of the British metal band for more than two decades. Grimmett updated fans via a Facebook posting in early January noting, "2016 has started and that means only 29 days until I start touring again. This year it's Europe then North America, South America, plus a new album... bring it on!" He continued in discussing the new album saying, "I am tremendously proud of the album. It has taken a long time because it has been fraught with problems, but we have ended up with the best thing I have done in decades. We're all looking forward to bring it to the fans and excited to be doing a world tour, starting straight after its release, and carrying on until 2017." Surrounding himself with an all-new band, Grimmett recently completed a 22-date North American tour. The trek included stops in New York, Philadelphia, Detroit, Chicago, Milwaukee, Seattle, Los Angeles, San Antonio, and Austin. Due to its success, the band recently announced a planned return in the autumn to support the new album after release. Original GRIM REAPER guitarist Nick Bowcott joined STEVE GRIMMETT'S GRIM REAPER on stage on March 25 at 4 D's Bar & Grill in Fort Wayne, Indiana to perform several of the band's classic songs. Check out fan-filmed video footage below. Bowcott previously played with STEVE GRIMMETT'S GRIM REAPER in 2014, marking the first time Steve and Nick appeared on stage together in more than 25 years. GRIM REAPER's debut album, "See You In Hell", was released in 1984 and was distributed worldwide through RCA. A successful world tour in support of the album included an appearance at Texxas Jam in front of over 20,000 people. The band's 1985 follow-up, "Fear No Evil", showed improvement on the production front and also enjoyed moderate success in both the United States and Europe. Ebony Records delayed the release of the band's third album, "Rock You to Hell", by almost two years. The LP eventually arrived directly through RCA in 1987. The back catalog from GRIM REAPER was reissued in Japan in October 2008 via RCA/BMG.